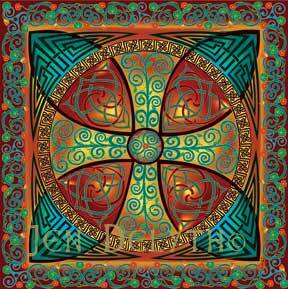 In the Celtic cross, it is the center where all spiritual forces come together. This mystical source is represented by the triskele motif symbolizing the Celtic trinity. The ancient Wheel Crosses represented the four seasonal positions of the sun–the four directions, elements and four seasons. These early Celtic crosses represent the turning of the cosmic wheel around the spiritual axis, the “life of the world”.